In the past I had worked on a good number of books with Daniel Kelm that utilized sewing methods that allowed for an unlined spine. Usually the decision not to line the spine was in accommodation to stiff, heavy pages that would simply delaminate a spine lining given the stresses associated with paging through the book. In general, I find that unlined spines afford better movement and allow a book to open flat without strain. 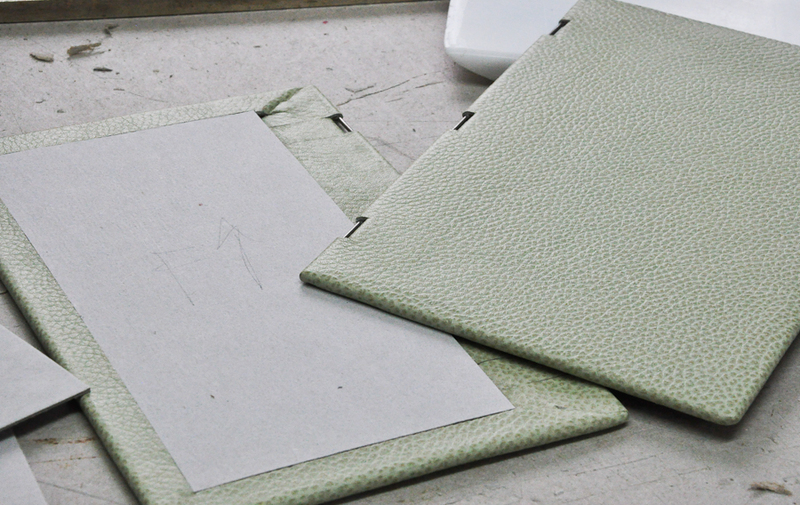 However, without a spine lining, the sewing needs to be stable enough to hold up on its own without that added support. Dan’s solution to this is the gutter wire, and particularly, his technique of sewing on raised cords with a gutter wire. It is a fantastic invention and allows for great flexibility (and creativity!) in materials and structure. Here is a different take on that method, but this time without the gutter wires. Instead, I perforated vellum tapes with a 1 mm punch at the point of each signature. In doing so, I could also fix the signature spacing to achieve a desired amount of swell. The sewing does not run all along the spine, but instead uses paired needles at each sewing station (i.e. at each tape). 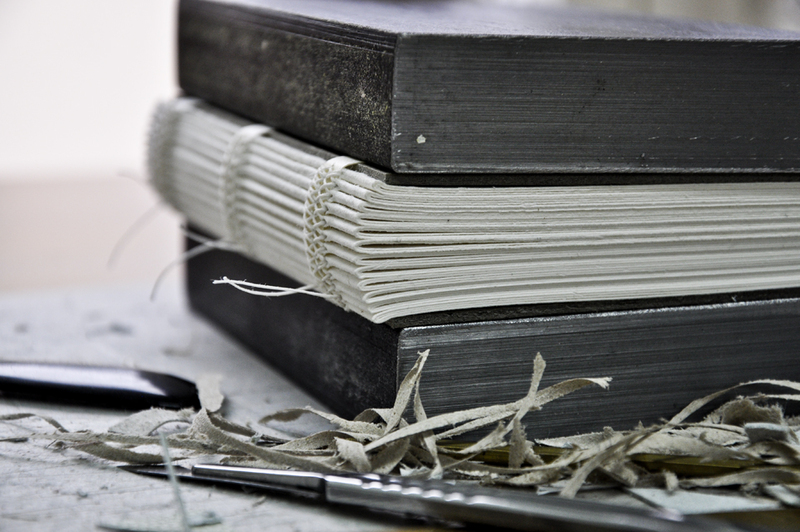 The thread crisscrosses the vellum tape and runs twice through the inside of each signature at each station. 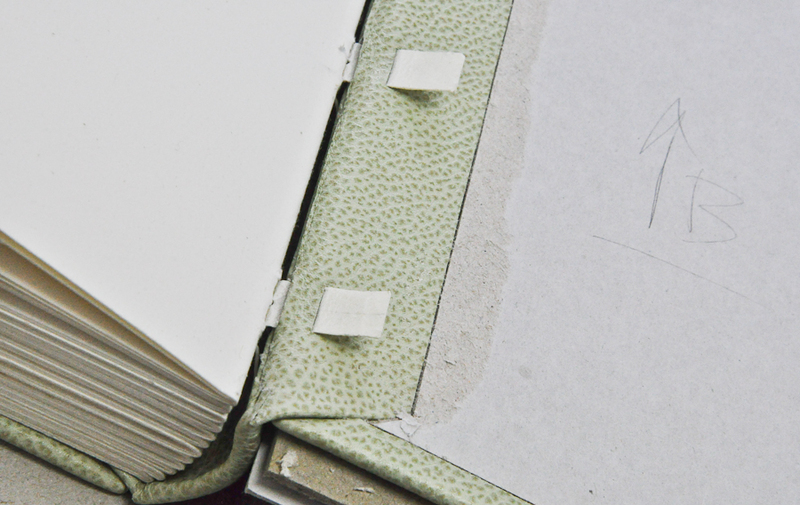 The sewing ends up feeling very stable without too much ‘play.’ And, with the appropriate swell set by the spacing of the holes on the vellum tapes, the book takes on a nice round with a simple massage into place. 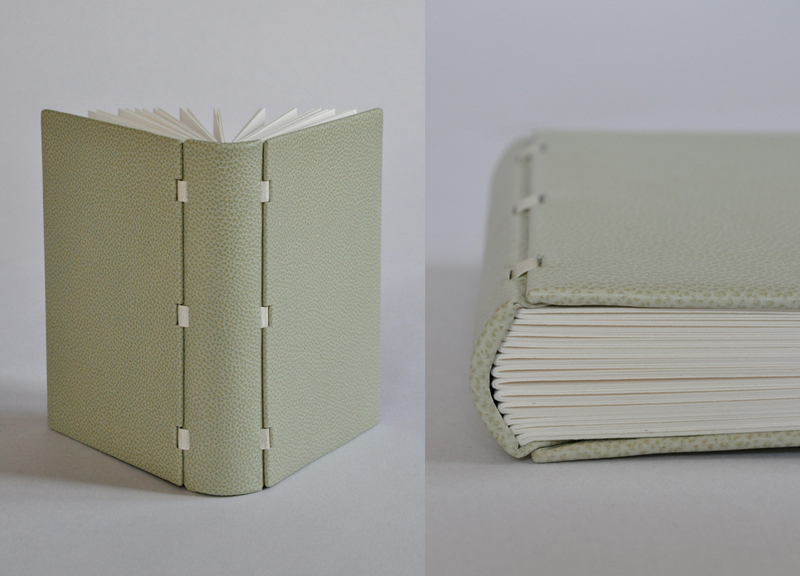 Once the book is cased in, the rounded spine holds its shape even without a lining. To case the book in, I molded a rounded spine piece and laced the tapes around heavy stainless steel wires built into the board edge.